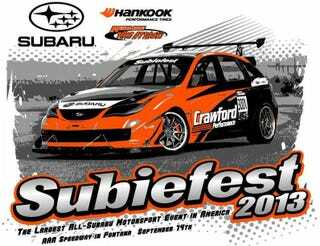 Come Hang Out with Me at Subiefest This Weekend! I've never been to Subiefest. I've been a BMW guy most of my life, but lately I've been driving for Crawford Performance which is a Subaru shop. You mostly likely know them from Matt Farah's show on the Drive Channel where he checked out Crawford's 450hp turbo BRZ street car. But they are also the performance shop that Ken Block chose for the build of his Gymkhana Subaru that changed car videos forever. I know Crawford Performance for their 850hp WRX STi that Tanner Foust and Tarzan Yamada drove in time attack. I also spent countless nights driving the car in Dirt3 which is why this is so cool for me. Obviously its an all Subaru show as you can see in the photo below, but you don't need a Subaru to attend, just expect to park your non-subaru lot. Here are the rest of the events for anyone that's thinking of coming out! And you should, its going to be fun. Thousands of Subarus: street, race, show, rally, muddin', as long as it's Subie! Huge vendor section w/ epic deals. Over 70 Vendors! Thousands in give-aways just for attending! Simulator Racing, Classic Video Game Plaza, McSubie Entertainment Lounge + Kids Area, more family fun! A whole bunch more in the works!!!! I'm obviously running the track sessions saturday but I'm pretty fired up about the autocross and simulator racing too! I'm driving Crawford's 850hp WRX STI on track, but I'm hoping I can enter the BRZ in the autocross which might quickly become a driftfest given how much power their rwd BRZ makes! Check out this video of us entering the 500hp turbo BRZ in Redline Time Attack. This is the same series I'm running the WRX in on Sunday. If you guys are near Fontana Saturday or Sunday come out to the track and take a look in person, Please stop by Crawford's area and say hi. I should be hanging out there when I'm not on track. It will be a good time. Of course, what do I know? This is part of the car world is pretty new to me but man has it been fun so far. And it looks like there will be "models" there too which is always good.